Programs: AM (8:30-12:30 a.m.), PM (1:00-5:00 p.m.), 9-3 (9 a.m.-3 p.m. M-Th, 9 a.m.-12:30 p.m. F), and LAP (8:30 a.m.-5:30 p.m.). Early drop-off and late pick-up options are available. Faculty: 46 teachers, of whom 32 are Montessori-certified and 13 are working towards certification; 22 have masters degrees and 12 are enrolled in a masters degree program. Our teachers represent 15 countries and speak 13 languages. We prepare children to be resilient, creative and independent problem solvers. We are leaders in teaching Montessori principles and incorporate the best practices of modern early childhood education in our classrooms. 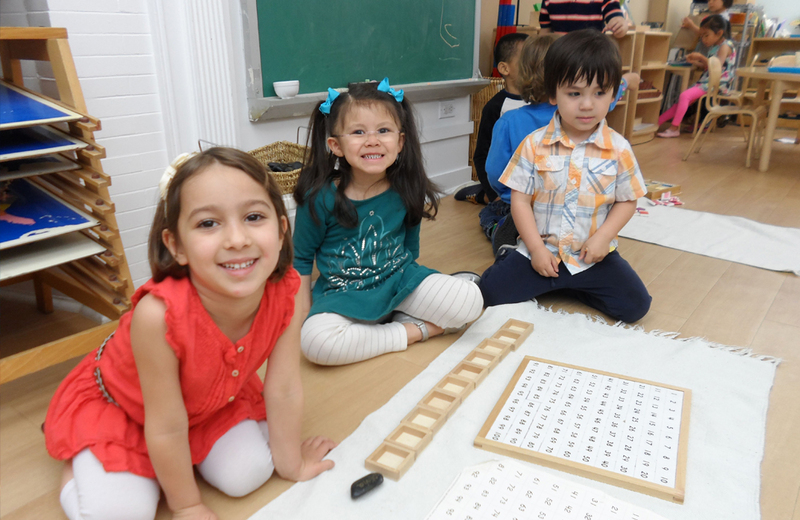 West Side Montessori School is a vibrant, collaborative community of passionate teachers, joyful children and engaged parents. Our diverse community is a reflection of the city in which we live. West Side Montessori School was founded in 1963 by five couples (Gil and Sarah Burke, Boker and Susanna Doyle, Larry and Olivia Huntington, Fritz and Marian Schwarz, and Joe and Bay Wasserman) who together envisioned an early childhood school on the Upper West Side that would provide an exceptional, innovative Montessori education for a richly diverse mix of families. The School opened with one morning class of fifteen children and one teacher in a room in the Frederick Douglass Houses on Columbus Avenue at 104th Street. As enrollment grew, the School moved from one rented space to another while searching for a permanent location. In the spring of 1974 the School bought the double brownstone at 309 West 92nd Street that remains our home today. Over the years every space in the building has been renovated; all our classrooms underwent an extensive “green” renovation; our full size gym and roof top play space are equipped with state of the art equipment to encourage creativity as well as physical and social development; and our professional kitchen produces nutritious daily meals. Since 1963 the student body has grown from 15 children to more than 200, the number of teachers has grown from one to more than fifty, and we now have our own Montessori certification program, WSMS Teacher Education Program (WSMS-TEP), that educates more than 50 student teachers each year—but the ideals on which our school was founded are still very much intact.